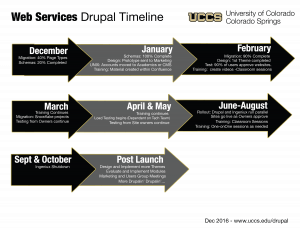 UCCS Information Technology’s Web Services will begin to migrate a handful of university webpages to a new content management system starting next week and then will release a timeline for the migration of all pages through the end of 2017. The initial migrations follow the Information Technology department’s successful project to move the UCCS website to a secure server system, a key step in the migration. That project wrapped up this week, said Craig Decker, manager, Web Services. Web Services will begin to migrate the webpages of about 10 UCCS units next week to what’s called a staging server for testing. That server will offer a chance for Web Services and the managers of those webpages to make sure their site content moved successfully from the current Ingeniux content management system to the new Drupal system. Those early Drupal adopters, including IT, the School of Public Affairs and the Graduate School, will be notified before their pages are moved to Drupal. Web Services has been working since 2015 on plans to migrate more than 9,000 university webpages to Drupal. More than 500 UCCS staff members and student employees who manage websites will receive training on the new content management system. The training schedule will be included in the timeline released in early August by Web Services. Training will include classroom and online sessions as well as drop-in times with Web Services. Drupal is open-source content management software maintained by more than 35,000 developers around the world. CU Boulder uses Drupal as its content management system. 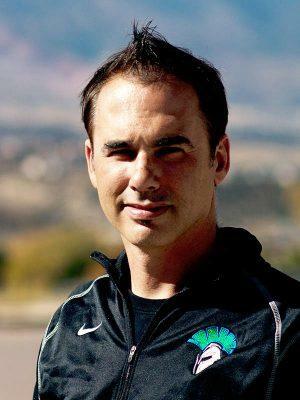 “UCCS staff members who manage webpages with Ingeniux will find Drupal an easier system to use,” Decker said. Drupal offers other improvements, too, including being optimized for phones and other mobile platforms. Ingeniux has been in use on campus since 2011 and will be turned off after the Drupal migration. The move to Drupal is not a website redesign – Web Services is migrating only existing webpage content from Ingeniux to the new system. Campus managers who want to redesign their webpages are encouraged to request that separately with Web Services. Questions about the migration can be directed to Craig Decker, cdecker@uccs.edu, or on this Web Services page about Drupal.